Confession... I don't like to cook. It has taken me 4 1/2 years of marriage to admit this. When we got married all those years ago I thought I would love to cook and I started strong, but you can ask Andrew... he won't know when our last fresh cooked meal was. I got into those freezer cook days to an extreme a while back and seriously have not cooked since! I am cheap frugal. I don't like spending lots of money, especially on temporary things. The past few years I have been so overwhelmed by work that I almost never had time to cook. I also have this issue with trying to be "productive," I have never seen my time cooking as productive time. Something I have learned about myself- I am more of a big picture person than a details person. This past week, 2 of the best cooks I know (mom and younger brother) were watching me try to fry eggs. They both wanted to take the spatula from me. Last week I also made the ugliest batch of pancakes for Andrew and I. We have had very small kitchens for the past 4 1/2 years... with no dishwasher! 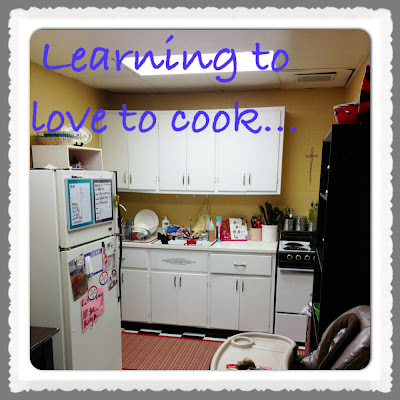 Okay... All of that being said, I want to learn to love to cook! I will be looking at grocery ads, Pinterest, etc. to find inexpensive, not time consuming, tasty meals. Join me in this journey!